Dr Holland became a human plant hybrid in Swamp Thing, a DC Comics Adaptation by Wes Craven, for whom we have some admiration but who hasn’t done much to ingratiate himself to fans with his recent output. In the Bayou swamps, the good doctor and his sister are doing an experiment trying to create a hybrid character, when it’s interrupted by a paramilitary group who wants to put his research to evil means. This was post-Last House on the Left and Deadly Blessing and was a bit of a departure for Mr. Craven. It features genre favorites Ray Wise, David Hess, Adrienne Barbeau and Louis Jordan. There’s also a horribly obvious rubber suit and the guy who played Paulie in Darkman! 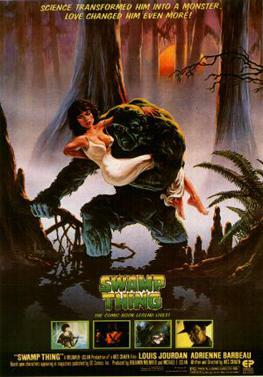 Join us as we venture into the Louisiana swamps with Swamp Thing!